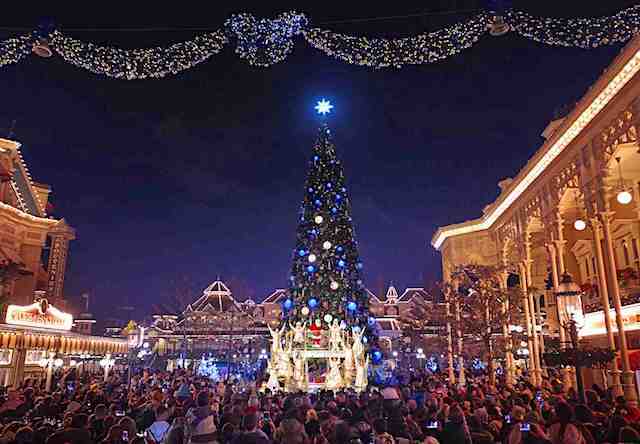 November 20, 2018, 5:32 PM · This past weekend, Disneyland Paris launched to the media their Winter programme – a mix of entertainment celebrating both Christmas and the 90th birthday of their iconic mascot, under the collective banner of Disney's Enchanted Christmas: A Very Merry ChrisMouse. 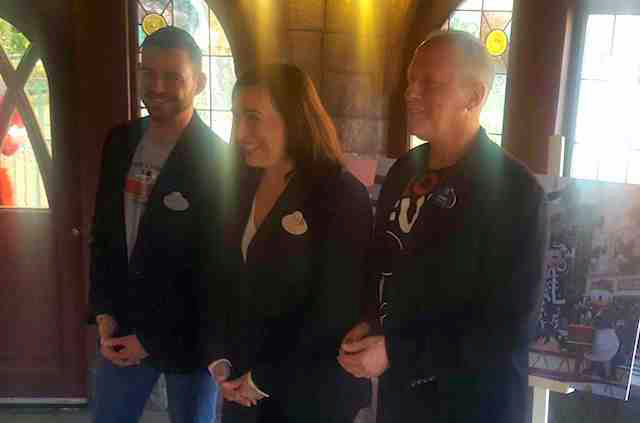 The event began with a roundtable event in which we heard from Matthieu Robin (Associate Show Director), Lydia Richard (Character Integration) and Mark Huffman (Creative Director), who previewed the season's entertainment and gave some insight into how it had all been developed. 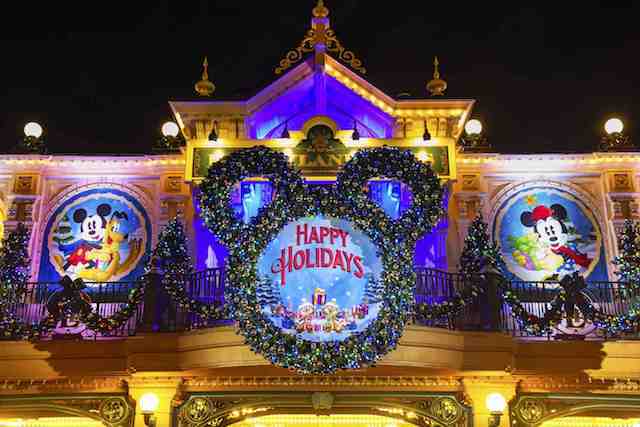 Where other Disney parks have largely kept their Christmas seasons separate to events marking the anniversary of Mickey Mouse, the team here have skilfully woven the two things together to tell one story. In Huffman's words, both offer "an excuse to come together [and be] surrounded by friends and family" – our real ones, and Mickey's imaginary ones. 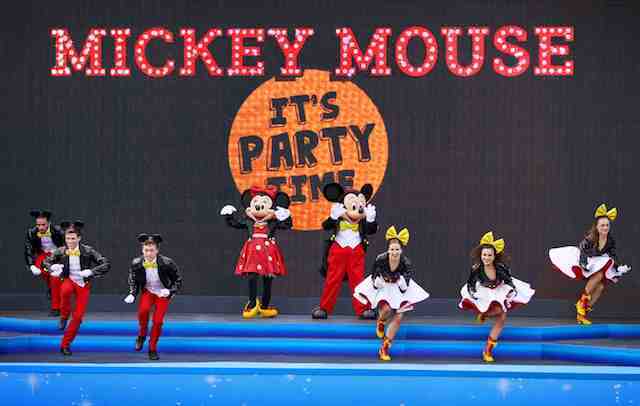 And it's that idea that reverberates through most all the entertainment you'll find across the resort this season. The park's Castle Stage plays host to A Merry Stitchmas, returning from 2017 with some tweaks. 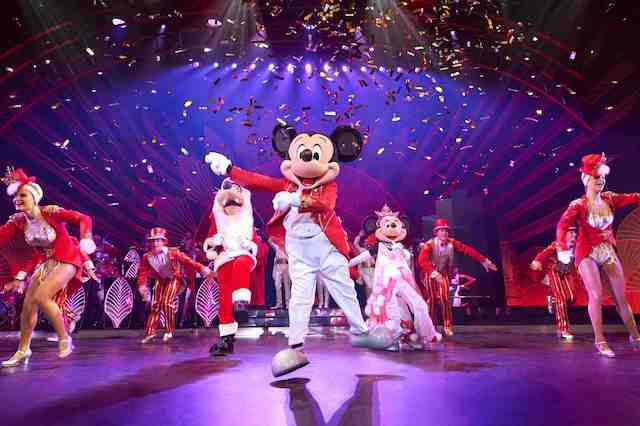 It's a typically Disney-esque, high-energy spin through Christmas songs, loosely tied together with hijinks from Stitch and Goofy. 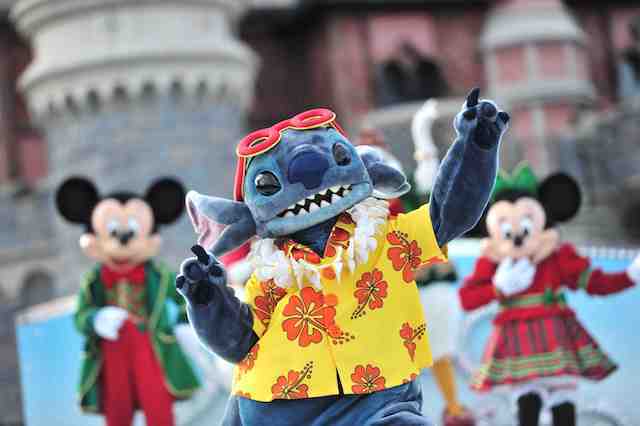 We stuck around after that to catch Disney's Christmas Parade, similarly returning in tweaked form. 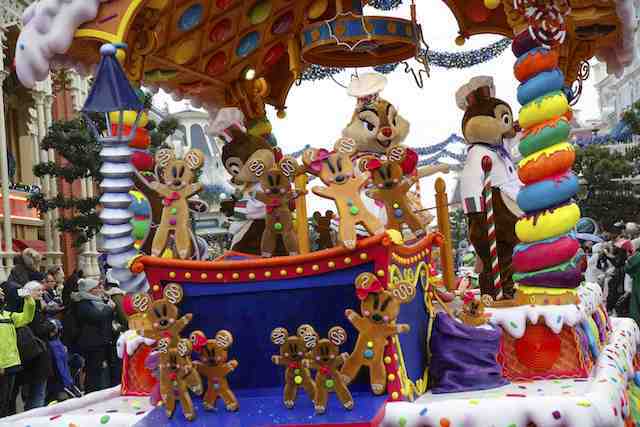 Again, it's much what you'd expect from this kind of presentation, with cute float designs and solid choreography across the route, all tethered by an anthem extolling the values of "peace, understanding and love for one another." Classically schmaltzy stuff, I know, but experiencing it first hand really reminded me of what a powerful role theme parks can still play in promoting positive cultural narratives – and just how important a role that is in current times. The seasonal additions in the park conclude with Mickey's Magical Christmas Lights, a simple but sweet ceremony around Main Street USA's impressively-lit tree, and Celebrate! 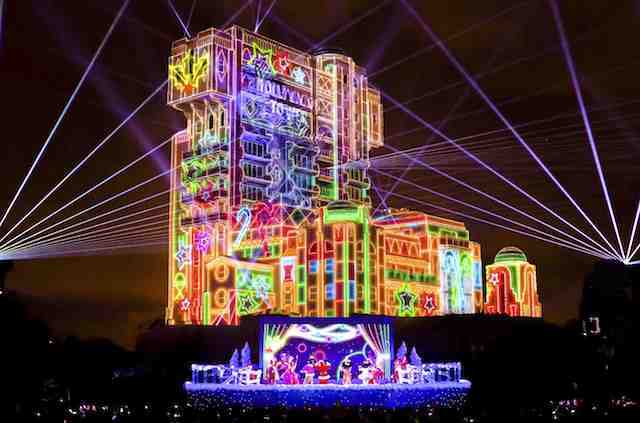 90 Years of Mickey, a special five-minute presentation before Illuminations. The latter piece in particular was a real surprise to me; it doesn't deploy Illuminations' technology to the same epic effect, but is a charming jaunt through the history of the character that still manages to make smart use of the castle's shapes and textures. Definitely one to find your viewing spot a little earlier than usual for. But playing a show like this five times a day is a tough gig, and – on the performance I saw at least – the quality of both singing and dancing was just too much of a mixed bag to effectively sell the concept. Tap and jazz are demanding disciplines, so hopefully both those elements will tighten up in the coming weeks. It's still a fun show, and a welcome chance to get out of the cold, but hasn't yet reached its potential. On much surer footing across the courtyard is #SurpriseMickey, 17 minutes of the kind of utterly-bizarre yet brilliantly-entertaining spectacle that the Parisian team still does better than any other Disney resort. Packed with great choreography, an insanely catchy theme tune, and a unique visual style in the video work, it was probably my highlight across both the parks. It's full of surprises (the title kind of gives that away, right?) but the most joyous element is the way nearby Cast Members, ostensibly just on crowd control duty, are roped into the dance numbers. It's yet another declaration from the park that CMs are as integral a part of the resort's story as anything or anyone else, and beautifully evokes that sense of everyone “coming together” that the creative team established as their brief. The park's events conclude with Goofy's Incredible Christmas, featuring a mixture of live character performers, projection onto the Tower of Terror, and a few bursts of fireworks to sign off for the night. It doesn't seek to push an emotional connection in the way other “kiss goodnight” shows aim for and – refreshingly – largely avoids becoming a montage of clips from Disney movies. It's not the best of Disney's projection mapping efforts, but the attempt to tell an original story and incorporate some live elements is endearing – and in a park that really benefits from giving guests a big send-off at the end of the day. The last piece in the puzzle, another show set to take over the Cinemagique stage later this month, will apparently be smaller in nature, "capitalising on the cinematic feel" of that theatre and featuring a mixture of sing-a-long and movie moments. Look out for more details to be announced on that soon. Disney's Enchanted Christmas runs through January 6, 2019.